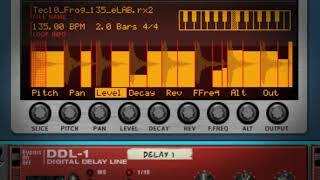 Load your loops into Dr. Octo Rex - Reason’s loop player. Each player loads eight REX loops and lets you switch between them on the fly. This makes arranging a breeze - load the drum loops into one player, the guitars into another and use the sequencer to select what loop to play in a pattern-like fashion. Rex loops are audio loops that have been sliced into their rhythmic components, either in ReCycle or in Reason’s sequencer. This lets you work with audio loops in completely new ways: change the tempo, change the key, change the groove, rearrange each slice of the loops to create variations and fills! With eight loops to switch between, the Dr. Octo Rex loop player also comes ready for the experimental minded. 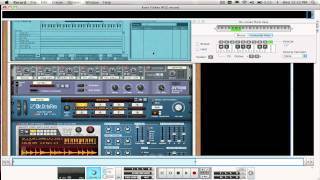 Set the player to retrig the loops on the beat, on the bar or on the 16th note. Or export the slice trigger notes to the sequencer, with the original timing intact, and rearrange the loop any way you like. 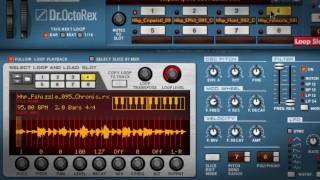 To ge creative with the loops, Dr. Octo Rex has a comprehensive sound sculpting section too, with filters, envelopes and modulation settings to help you craft the sound you are looking for. For each of the eight loops, the Rex player also comes with a set of per-slice settings. Set pan, pitch, filter frequency and level, reverse slices, use multiple outputs, create alternating groups of slices and much more.